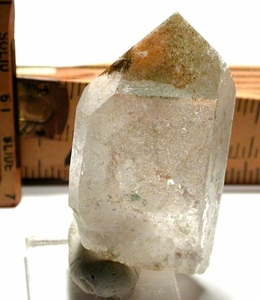 Gorgeous green-white-buff chlorite phantoms in this tabular Isis faced Arkansas rock crystal cap a very clear prism with more chlorite inclusions. Three sides are partially, preferentially lightly etched, two have several bright glitter crystals. A large miniature of 5/8x 1-1/4x 2-1/4" which could make an amazing pendant.